It was not too long ago that Pittsburgh was firmly positioned as the steel city, in both the practical output of the economic product, and in the national conscience that viewed the skyline with smoke colored glasses. Now, buoyed by strong partnerships with excellent higher education institutions and a thriving medical community, Pittsburgh is nationally ranked as one of the most desirable places to live and work. As Catalyst Connection enters its fourth decade of promoting, providing support, and strengthening manufacturing in Southwestern Pennsylvania, we are excited to continue the positive dialogue around Pittsburgh while addressing the ways in which the region still has room to grow and embrace the future as an innovative and global hub for advanced manufacturing. Catalyst Connection initiated the “Making Your Future Manufacturing Employment Demand Study” to support manufacturing job growth in Southwestern Pennsylvania and to better understand the current and projected demand for workers and the skill sets sought after by the regions’ employers. Key goals of the study were to determine if there is an increased need for: investments in workforce development, improvements in immediate employability skills, change in perceptions of manufacturing careers, and improved employer practices to attract and retain a skilled and qualified workforce. The Employment Demand Study was conducted during the period of May – June, 2018. Catalyst Connection Celebrates 30 Years of Assisting Manufacturers with their People, Processes and Products! We make it our goal to create positive results for every one of our clients through consulting, training and financial programs. Over the past 30 years, we’ve helped more than 1,700 manufacturers across 12-county region significantly reduce their costs while improving profitability and increasing revenue. The 2017-18 Annual Report touches upon the September 2017 Brookings Report, “Capturing the next economy: Pittsburgh’s rise as a global innovation city” and how the Greater Pittsburgh region is poised to be a leader within the manufacturing industry. This report also highlights some of the ways that we have helped our clients over the past year. Petra Mitchell provides an overview of the MEP program, the challenges that small and medium sized manufacturers are facing, and the role that the MEP program and Catalyst Connection are playing in helping to address those challenges. The US Senate Committee on Finance was held on Friday, February 16, 2018. 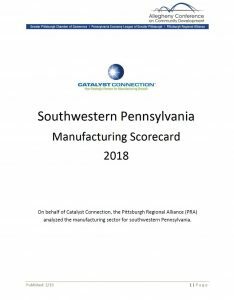 The Pittsburgh Regional Alliance and Catalyst Connection releases the 2018 Manufacturing Scorecard for southwestern Pennsylvania. 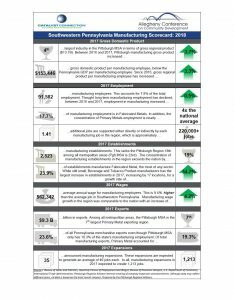 The Pittsburgh Regional Alliance and Catalyst Connection releases the 2018 Manufacturing Scorecard Summary for southwestern Pennsylvania. The staff and Board of Directors for Catalyst Connection are pleased to share with you some of the good work that was done in 2016 in the manufacturing community of southwestern Pennsylvania. We are pleased to share how MAKING YOUR FUTURE JUST GOT EASIER – easier for students to better understand manufacturing opportunities, easier for adult job seekers to learn about and network with manufacturing leaders, and easier for employers to find skilled talent. Pittsburgh’s innovation economy is strong and growing, but city leaders can do more with its existing assets to compete globally and capitalize on the region’s growing innovation clusters, according to a new report from the Anne T. and Robert M. Bass Initiative on Innovation and Placemaking at the Brookings Institution. The culmination of an 18-month study, “Capturing the Next Economy: Pittsburgh’s rise as a global innovation city” examines Pittsburgh’s unique opportunity to become a top global destination for technology-based economic activity and as a key part of Pittsburgh’s efforts to become a world-class innovation city. Catalyst Connection is part of the national Hollings Manufacturing Extension Partnership (MEP). Since 1988, MEP has worked to strengthen U.S. manufacturing. It is part of the National Institute of Standards and Technology (NIST), a U.S. Department of Commerce agency. Through its collaborations at the federal, state and local level, MEP centers in every state work with manufacturers to develop new customers, expand and diversify markets, adopt new technologies, and enhance value within supply chains. As a public-private partnership, MEP delivers a high return on investment to taxpayers. For every one dollar of federal investment, the MEP national network generates $17.9 in new sales growth for manufacturers and $27.0 in new client investment. This translates into $2.3 billion in new sales annually. And, for every $1,501 of federal investment, MEP creates or retains one manufacturing job. DDI published this report, PROOF That DDI’s Leadership Development Pays Off, that identifies the quantitative results of companies who participated in DDI trainings. This report is the world’s largest aggregation of impact studies and analyses on the effectiveness of a single leadership development program: DDI’s Interaction Management® (IM®). The data-based evidence captured is an “insurance policy” to customers that IM® will positively impact their leaders, their teams, and the entire organization! Catalyst Connection is an official educational channel partner of Development Dimensions International (DDI). We are certified to bring their world-class leadership content to manufacturing companies in southwestern Pennsylvania. We include DDI content in many of our Organizational Development services, including: Leadership Essentials, Executive Leadership Coaching, 360 Feedback, Success Profiles, and our Emerging Leaders in Manufacturing program. The Pittsburgh Business Times hosted a Table of Experts to discuss issues related to the additive manufacturing industry in our region on March 4. Panelists included: Connie Palucka, NPDP, Managing Director, Regional Initiatives, Catalyst Connection; and Vicki A. Barbur Ph.D., Senior Vice President and Chief Technical Officer, Concurrent Technologies Corporation.